A ferry heading to Lithuania from Germany was able to continue its journey on Tuesday, hours after it lost power following an engine room incident, Lithuania's Defense Ministry said. The Lithuanian-flagged Regina Seaways, carrying 335 people, restored power to its main engine four hours after it issued a distress call due to a suspected fire in its engine room, the ministry said. 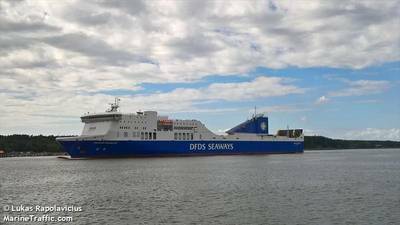 No one was reported injured and the ferry was expected to dock in the port of Klaipeda by 2100 GMT, a spokesman for Danish ferry company DFDS said. "There was vibration and there was smoke, but no fire was noticed," the spokesman said, contradicting reports from the Lithuanian military of a fire on board. Lithuania's Defense Ministry said the fire had been extinguished and that four Lithuanian military ships had been sent towards the ferry to accompany it to the home port.